With the inheritance he received upon his father’s death, Miles has come to Europe on the trail of the Romanian surrealist, who disappeared into a forest in 1967. But in trying to unravel the mystery of Bafdescu’s secret life, Miles must also reckon with his own. 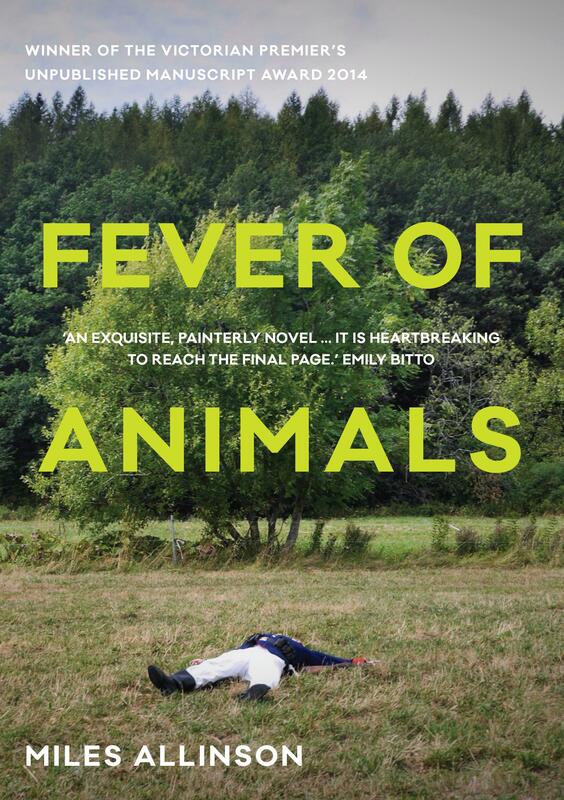 Miles Allinson’s Fever of Animals was just a pile of loose A4 pages when I first read it, as a judge for the 2014 Victorian Premier’s Unpublished Manuscript Award – which Fever of Animals ultimately won. It fundamentally impressed and roused me, and I was stoked that we judges could agree that it stood out from the hundred-something entries – no mean feat, considering that 2014 wasn’t a shallow pool: three other manuscripts (that I know of) among the runners-ups and commended lists have also since been acquired by Australian publishers. More than any other reason, I was stoked for the manuscript to win the award because I knew it would mean that publishers would read it not as they might have one day (as an unsolicited submission, probably offhandedly) but instead as a book-in-waiting. Is this a slight on the work, on its onerousness? No — books often benefit from their backstories. A slight on the industry, or even on our neoliberalist society? Perhaps, but that’s not for here. Fever of Animals has a plot, sure, as much as every person’s day and every person’s week and every person’s life could be said to have a plot. It is about searching, and it is about our narrator’s interlinked searches: he seeks to understand why he pushed his partner–lover away, he seeks information on a not-well-known dead surrealist painter, he seeks meaning. The book is also ‘about’ much more: time, nature, relationships, drinking, longing, regret, language, running, cruelty, and art, amongst other things. Miles Allinson is unashamedly a serious writer, in the mould of dark luminaries like Roberto Bolaño, Thomas Bernhard, Robert Walser, and perhaps W.G. Sebald. And Fever of Animals takes itself seriously, like good art should do. It takes itself seriously like John Maus’s songs do and Rick Amor’s paintings do and Vivian Maier’s photos do and Abbas Kiarostami’s films do and Samuel Beckett’s plays do. And it takes you seriously. All it asks is that you take it seriously back, and to do so is pleasurable and challenging and nourishingly sad. A sharp-edged semi-futuristic riff about a rebellious teenager's last week at an industrial orphanage.